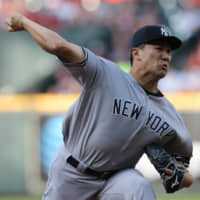 HOUSTON - Masahiro Tanaka tossed six solid innings but missed out on his second win of the season as the New York Yankees fell 4-3 to the Houston Astros on Monday. The 30-year-old right-hander, who is 1-0 in three starts this year, held the Astros to a run on three hits and two walks at Minute Maid Park, but lefty reliever Zack Britton squandered the Yankees’ 3-1 lead. In the fourth, Tanaka gave up a game-tying solo homer to Jose Altuve and issued a walk, but a double play limited the damage. He ended the inning with his third and final strikeout of the game. Aaron Judge went deep against Justin Verlander in the fifth to put the Yankees back on top, and Clint Frazier extended the lead to 3-1 with an RBI single in the sixth. 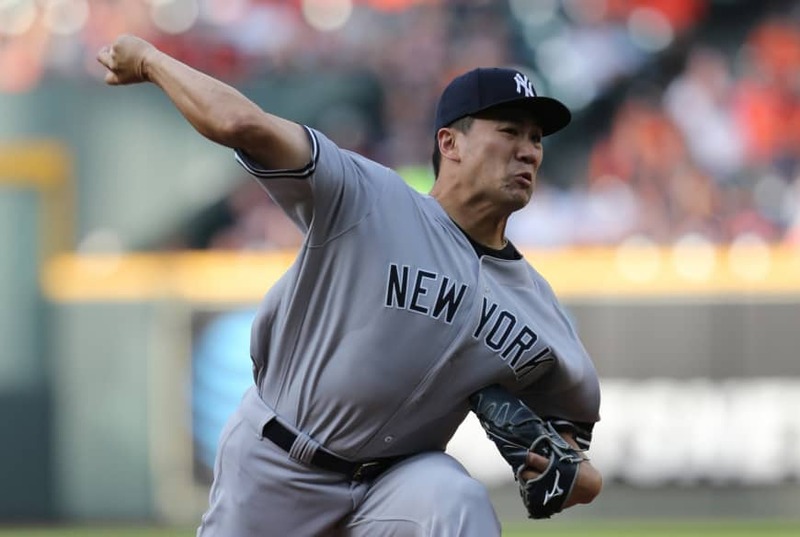 Tanaka gave up a double and issued another walk in the bottom of the inning, but coaxed three straight outs before his exit to keep the Yankees’ lead intact. “I think I pitched well overall,” Tanaka said. In the seventh, Britton allowed the Astros to tie it on a two-run double from Robinson Chirinos. With one out in the eighth, Adam Ottavino (1-1) walked Alex Bregman before a single by Michael Brantley sent Bregman to third. Correa then shattered his bat on a grounder that dribbled up the first base line, allowing Bregman to score. “Sometimes it’s better to hit it soft, I guess,” Houston manager AJ Hinch said with a smile. New York skipper Aaron Boone said it was a well-executed pitch by Ottavino. Verlander struck out six and gave up three runs on seven hits and two walks in six innings of work. Ryan Pressly (1-0) got the win for pitching a perfect eighth. In Chicago, Kyle Schwarber hit a two-run homer and the Cubs’ beleaguered bullpen stepped up after Jon Lester departed with left hamstring tightness against Pittsburgh. Brad Brach, Brandon Kintzler, Randy Rosario and Pedro Strop combined for seven innings of four-hit ball after Lester was removed with two on and no outs in the third. Brach (1-0) pitched two innings for his first win with Chicago. The Pirates had won four in a row, but hurt themselves with four errors, including three by shortstop Kevin Newman. Jameson Taillon (0-2) was charged with six unearned runs and four hits in two innings. In Anaheim, Mike Trout made a leaping catch to steal a potential homer from Christian Yelich, and Los Angeles beat Milwaukee for its fourth straight victory. Trout’s personal streak of four consecutive games with a homer ended when he went 0- for-2 with two walks, but the superstar jumped high on the warning track to take away an extra-base hit from Yelich, his fellow MVP. Jhoulys Chacin (2-1) pitched three-hit ball into the seventh inning but took the loss. In Philadelphia, Rhys Hoskins hit two solo homers, Odubel Herrera hit a two-run shot and the Phillies edged Washington. Bryce Harper was 0-for-3 with a walk in is third game against his former team but helped prevent a run with a perfect relay throw. In Kansas City, Edwin Encarnacion homered twice during an eight-run sixth inning, two of five homers for hot-hitting Seattle against the Royals. Encarnacion became the first Mariners player to go deep twice in an inning since Bret Boone and Mike Cameron both did it May 2, 2002, against the White Sox. He’s the fifth player to homer twice in an inning more than once, joining Alex Rodriguez, Jeff King, Andre Dawson and Willie McCovey, according to STATS. In St. Louis, Marcell Ozuna homered to back a solid start by Miles Mikolas, and the Cardinals ended Los Angeles’ five-game winning streak. In San Francisco, pinch hitter Franmil Reyes connected for a go-ahead, two-run homer in the seventh inning, and San Diego rallied from five down against Madison Bumgarner to beat the Giants. In Denver, Ronald Acuna Jr. homered, Dansby Swanson drove in three runs and Atlanta held off Colorado for its first road win of the season. In Chicago, Blake Snell (2-1) struck out 11 over six innings, giving up one run and six hits as Tampa Bay improved to 8-3 and kept pace with its best start since 2010.